Finding new content all the time is a drag. That’s why we automatically Recycle your Evergreen Content. 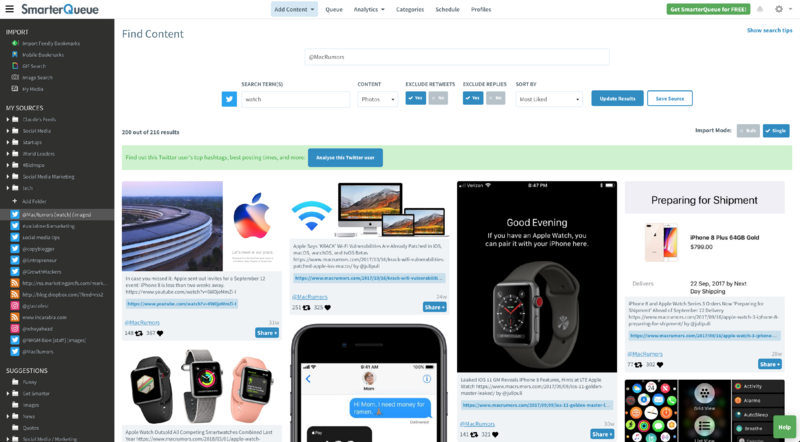 We’ve also designed our intuitive search bar to help you find great content from Facebook, Twitter, and Instagram, browse through the posts like Pinterest and add them to your Queue in a couple of clicks! Head to the Find Content page and search for your next piece of curated content. This little beauty (i.e. search bar) revolutionises the way you’ll search for content. Not only does it search entire Twitter, Instagram, and Facebook accounts for specific content, but it also lets you search by #hashtag, @mention, or within your Twitter lists. It’s the most effective way to find articles/photos for a specific topic, import posts from favourite sources, or learn from your competitors.If your search delivers a lot of quality content, you can save it to your Sources, so you can re-visit it again in one click, whenever you want. Social media experts recommend that only about 20% of your posts should be self-promotional. We make it easier and quicker to find the value-added content that makes up the remaining 80%. Get more value out of the links you share, and automate the entire process.